As a prelude to the 2016 YANMAR Moth Worlds 2016, the 50th Japan National Moth Championships has been held in Hayama from 21st to 22nd May. Second day of the event, four races carried out with stable 8-12 knots breeze from NE. “Yesterday we only hold one race due to weak winds, so I’m really relieved that we have four races today. The wind was kind of weak in the first race so fleet weren’t able to start foiling, but it got steadily stronger after that, until we recorded a blowing wind of 20 knots during the third race”, said Taro Kyoguro, chairman of the race committee. Because of land breeze, surface of race area was flat and average wind speed was 10 knots, that’s a perfect condition for foiling. All Moth sailors were surely able to enjoy the race today. The best result today was Paul Goodison from UK. He raced in 1st, 2nd, 2nd and 1st during the four races, and got first place in the final ranking. In second place was another English sailor, Chris Rashley. And third place was Scott Babbage from Australia. Kohei Kajimoto won his second victory of Japan Moth Title in 28 years! 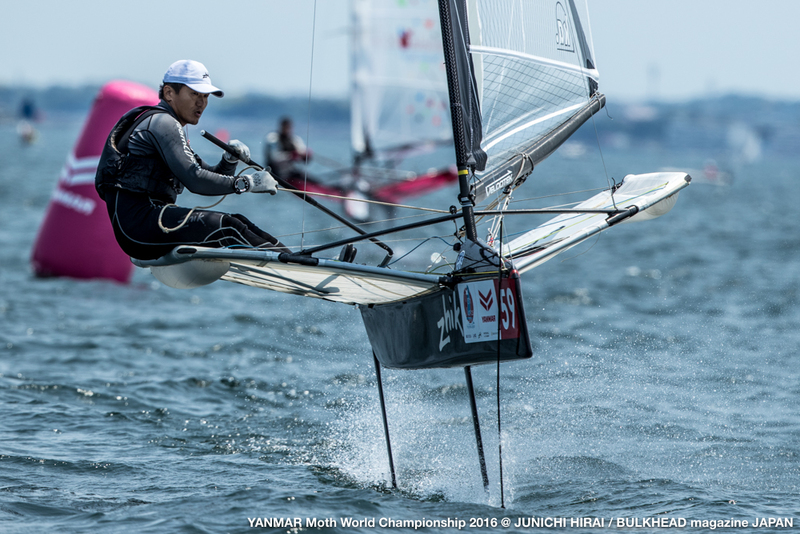 The first place of Japanese sailor was Kohei Kajimoto in 6th place, and he won the Japan Moth Title. In 1988, Kohei debuted Japan’s championships and achieved a brilliant victory. And now 28 years later, at the 50th anniversary regatta, he finally got his second title. “When I never thought it would take me so long to win my second one. I’m very happy with this result,” said Kohei. Wakako Tabata was the first female in 35th place. “Yesterday I had some problems with my boat. I’m not in my best condition today either, but I’m glad the result. I thought Emma, Emma Spiers from Australia would rank way ahead of me, so I was really surprised.” she smiled. Kohei and Wakako were happy couple both of them achieve the 50th title! It’s beautiful day on Sunday. The Hayama Sea was almost completely covered with yachts, more than 20 private boats and yachts have steered in close to the race area to watch the foiling races. And there were over 150 people on the spectator boat prepared by the race organiser enjoyed either watching the race or just going out of water. Tomorrow, the opening day on 23rd May, will feature a press conference with Sir Russell Coutts, CEO of Oracle Team USA, current defenders of the America’s Cup in attendance as a special guest ahead of the practice race and opining ceremony. 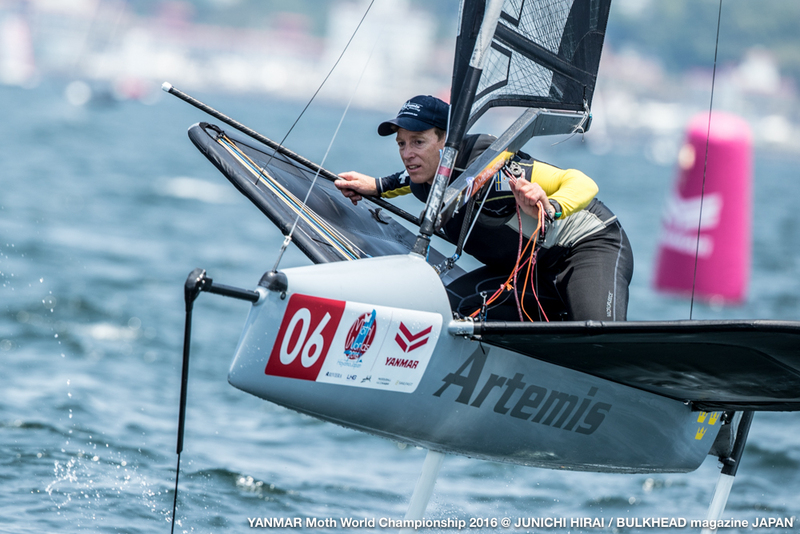 Finally YANMAR Moth World Championships 2016 kick off. Next Paul Goodison is the 2016 World Champion!